These eco-friendly zipper bags are composed of hemp with front and back PEVA panels. Hemp is a sustainable and appealing material that is also strong and durable. The front panel of the hemp zipper bags is clear PEVA plastic, and the back panel is frosted PEVA plastic. PEVA is Polyethylene vinyl acetate, which is lightweight, and an eco-friendly alternative to PVC. 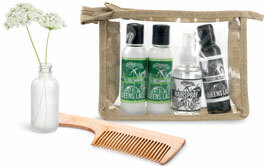 These hemp zipper bags are a sustainable option for packaging travel sets, cosmetics, and much more.